Two technology innovations have me thinking about ‘being’ somewhere, and the seemingly divergent forces now at work in our digital lives. The first was this post about ‘remotely piloted telepresence robots’ — essentially iPads on wheels running Facetime or Skype or some other videoconferencing system. I’m usually skeptical about prophecies of human-machine hybrids, but this approach seems both practical and inexpensive enough to take a step in that direction. It’s all existing technology. It works off existing WiFi networks. And it could (eventually) be reasonably priced (now about $2000 for the Double Robotics pre-order). And even at that price, if you could avoid four flights and hotel nights to visit a remote location, you’d have paid for the robot for just a single user (not to mention that the same robot could be used by hundreds of users in the course of a year). When you watch the short video (embedded below), you’ll see the potential applications not only in business, but in cultural experience. Can’t make it to the new exhibit in Prague? 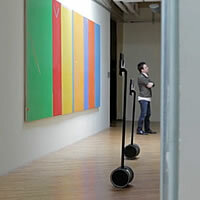 Rent a remote telepresence robot to wander the exhibit for you. Tired of the cost and time of campus visits with your high school student? Log on and take the campus tour through a remote counterpart. I also have a fantasy of a multi-national live theater production, with big-name actors performing through their robotic telepresence machine (someone suggested Waiting for Godot, I concur). The other technology that caught my eye was this tiny clip-on camera, that automatically takes two photos every minute, including geolocation data, building a snapshot history of what you were looking at throughout your day (it has no buttons, it just snaps over and over and over and keeps a tagged history with GPS data). This Kickstarter project achieved full funding in less than five hours, and is now funded at five times its original goal of $50,000. So much of our arts and culture infrastructure is about being specifically somewhere, or somewhere specific. Being in front of the actual object, sharing a live performance with others who are also specifically there, being in the same space as the creative expression. It’s worth wondering how that compelling element of our work could be extended or extinguished by these various ‘presence’ technologies. To riff on the idea, we could define it as culture through a form of geographic laparoscopy. The technology probes, examines, and even excises — similar to the way drones are used for spying and assassinations. Would this technological panopticon be presence, or only a simulation of presence? Would it reduce life and being to video images that could easily merge with the simulated (and often murderous) realities of our video games? And from a gendered viewpoint, would this form of peeping and probing represent yet another aspect of the masculinist nature of most technology? That’s the negative side, but I could also envision the technology used in hospitals, for example, where it would represent a form of caring. What’s the over-under on how many years until the in-person audience for the performing arts becomes the webcast equivalent of the “studio audience” for Oprah or Letterman? Already here in southern Indiana one can see the Met perform Otello at the local movie theater. Not too many years from now, we’ll all be watching the arts in our home theater environments instead of going there live. There will be mega-organizations that will be the equivalent of NFL teams, while the local, more amateur orgs fill in the niche of playing to live audiences. Live theatre is a collective experience, not just a voyeuristic activity. There is anticipation, sharing, the hubub of the front of house, the lights going down, the hush – the lounge bar, all fit into an experience of uniqueness and empathy not held up through technology. It is hard to top and we weeken the experience through alternatives. Brian, No one is saying that the future scenario I’m describing is all great. College football is a collective experience, too — the pregame, the bands, the noise, the camaraderie with the people in your section, the spontaneous excitement, etc. But it’s also really good on TV, too.